Launched in 1984, RV Belgica carried out many years of service, however, emerging mechanical issues in 2013 catalyzed plans to build her replacement. Kongsberg Maritime's delivery for the new vessel is based on a substantial integrated subsea package, comprising scientific, hydrographic, geophysical, SSBL and GNSS positioning systems. Kongsberg will also deliver a full sensor integration solution in addition to various third-party systems, to ensure efficient and sustainable operations. The Kongsberg series of Simrad scientific systems, including the EK80 wideband single-beam system, the ME70 multibeam system and the unique omnidirectional sonar SU90 that can detect and track life forms for several kilometers around the vessel, will form the foundation of the new craft's scientific scope. 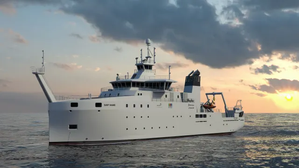 The vessel will also be equipped with the Simrad wireless PX trawl monitoring system and wired FX80 catch monitoring system, which can provide a live camera feed enabling monitoring of fish activity within the trawl. In addition, the delivery will include Kongsberg's acclaimed deep- and shallow-water multibeam echo sounders for bottom mapping; the EM 304 1 x 1 degree and EM2040 Dual RX. For geophysical applications, the TOPAS PS18 Sub-Bottom Profiler system will be used for high-resolution seabed imaging, while underwater positioning references will be provided by the industry-standard HiPAP 502 SSBL system, which only requires the installation of one hull-mounted transducer and one subsea transponder to establish a three-dimensional transponder position. Kongsberg's combined positioning and attitude sensor, the Seapath 380-R3 (featuring the IMO type-approved MGC-R3 compass system), will log the vessel's position and movement to ensure that all data is accurately georeferenced. A second MGC-R3 will also be positioned in one of the vessel's drop keels.